Although I had heard a lot of buzz surrounding 2013’s summer blockbuster, Pacific Rim, I didn’t get around to watching it until winter break (coincidentally, it was on my flight home from Taiwan… over the Pacific Ocean). I remember scornfully laughing at the over-dramatic trailer – “Today, we’re cancellin’ the apocalypse!” – but I was pleasantly surprised by how much I actually enjoyed the film. Directed by Guillermo del Toro, Pacific Rim pays tribute to the Japanese Kaiju (monster) and Mecha (giant robot) genres, but still feels fun and fresh. The movie has also received praise for its strong female protagonist, Mako Mori (my new cosplay dream!). Pacific Rim stars Idris Elba, Rinko Kikuchi, Charlie Hunnam, Charlie Day, Robert Kazinsky, Max Martini, Ron Perlman, and Burn Gorman. Pacific Rim is set in the 2020’s in an Earth terrorized by giant monsters called Kaiju, which enter our world through a rift at the bottom of the Pacific Ocean. To fight these monstrous beasts, the governments of the world united to build Jaegers, huge robots that defend the coastal cities. This Pan-Pacific Defense Corps is led by Stacker Pentecost. The Jaegers have a dual-pilot system. In order to effectively operate the robot, the two pilots, called Rangers, must be able to form a mental connection, called Drifting or a neural handshake. As such, most Rangers teams consist of siblings or married couples due to their compatibility. Despite the Rangers’ best efforts, more and more Kaiju come through the rift, overwhelming the defenses. When the government decides to withdraw funding from the Jaeger program in favor of building a coastal wall, Pentecost gathers the remaining Jaeger forces in Hong Kong for a last-ditch attempt to defeat the Kaiju once and for all. Raleigh and Yancy Beckett are brothers and the pilots of Gipsy Danger, a Mark-3 Jaeger. With four Kaiju kills to their credit, they make an extremely effective team. However, after a battle off the coast of Alaska goes wrong, Yancy is killed and Raleigh is left traumatized due to the psychological strain of piloting a Jaeger alone. Raleigh leaves his pilot history behind him, until one day Stacker Pentecost approaches him, and asks him to join forces with the other remaining Jaeger pilots. Despite the futuristic setting, Gipsy Danger’s design is inspired by the fighter planes of World War II. Accordingly, the Beckett brothers wear ’40s-style bomber jackets emblazoned with a pinup girl riding a bomb. Try out an updated version of WWII Americana with a modernized shearling jacket and a cargo-green dress featuring tough zipper details. Combat boots toughen up the look, while cheeky tights add a playful touch and evoke the saucy pinup girl style. The Rangers are pilots after all, so slip on a pair of aviators to complete the ensemble. Mako Mori, a young Ranger-in-training, is one of Stacker Pentecost’s brightest students and his adoptive daughter. As a child, Mako’s parents were killed during a Kaiju attack on Tokyo, which fuels her desire to avenge her parents by joining the Pan Pacific Defense Corps. Mako is a strong, capable, independent woman unafraid to stand up for what she thinks is right. She’s put in charge of finding a new co-pilot for Gipsy Danger. As she tests various candidates, it becomes clear that Mako knows she is the most qualified for the position, but Pentecost does not think she’s ready to be a Jaeger pilot. Mako favors monochromatic outfits that are stark and militaristic; her clothing is always immaculate, which echoes her personality. However, the cobalt blue highlights in her sleek bob haircut add a touch of rebellion. 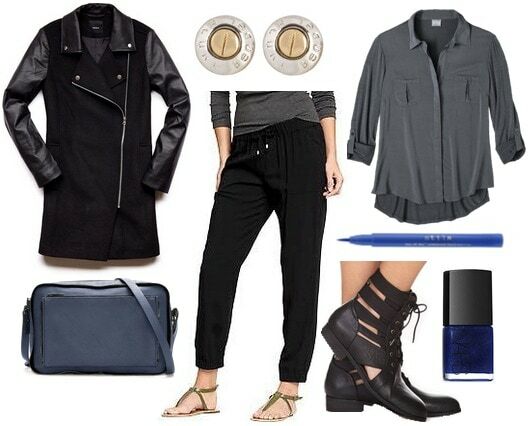 Get inspired by her simple but eye-catching style with an ensemble in black, gray, and navy. A charcoal blouse and slouchy black trousers provide a softer contrast to a sharp jacket and tough cutout boots. Rivet-shaped stud earrings and a minimalist messenger bag evoke the more futuristic look of Mako’s Ranger armor. Finally, add a pop of color in the form of a sweep of cobalt-blue liquid liner and nail polish. When the Neural Handshake is formed, the Rangers become privy to one another’s memories and thoughts, and they need to be careful not to let themselves latch onto memories that might cause emotional reactions. “Chasing the rabbit,” as they call it, can lead to a loss of control. During Raleigh and Mako’s first Drift training, she’s overcome by the terrifying memories of losing her parents as a child. Although this scene is tremendously sad and poignant, all I could think about while watching was how adorable little Mako Mori’s outfit was. (The perils of fashion blogging!) Her powder blue Peter Pan collar coat is reminiscent of Alice in Wonderland and Ofelia from del Toro’s Pan’s Labyrinth; the red buckled shoe she clutches later becomes a symbol of her emotional journey. Despite the rather bleak context of the outfit, it’s definitely a great sartorial inspiration. 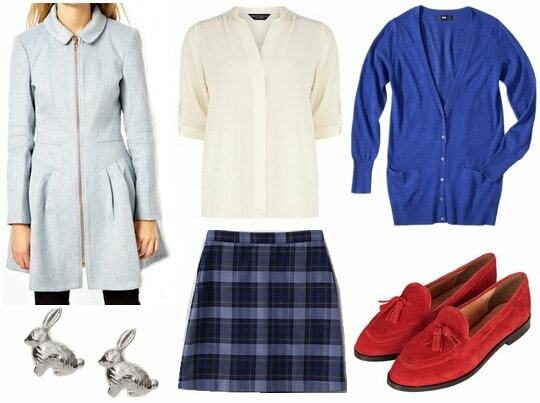 For a more grown-up take, try pairing an A-line plaid skirt with an ivory blouse. Tasseled red loafers are a quirky spin on Mako’s patent Mary Janes, while a zippered blue coat is a less precious version of hers. Would you wear these outfits? Have you seen Pacific Rim? What did you think of the movie? What other geeky inspirations would you like to see? Let me know by leaving a comment! Next Quiz: What’s Your Perfect Valentine’s Day Date?